How Big Of A Diamond Should My Engagement Ring Have? While the cost of an engagement varies wildly, there are some ways to help understand price points. Although even one carat diamonds can vary in price by as much as $12,000, the size of the diamond often has less to do with price than quality. Higher quality cut diamonds will typically demonstrate better quality in color and clarity. However, most people best understand diamonds by their size, or carat weight. Typically, engagement rings fall into one of three carat weight classes: under one carat, one to two carats, and larger than two carats. Larger diamonds are more rare, and therefore deciding how big of a diamond to choose will raise the cost. Diamonds under one carat are typically used either in budget friendly engagement rings or as accent diamonds. 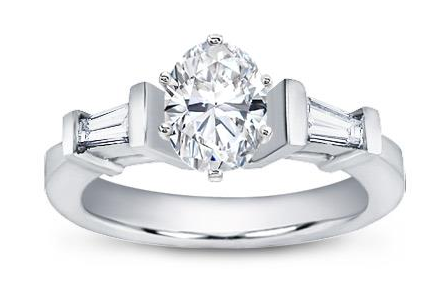 For example, a popular three stone diamond engagement setting is the R2237. This tapered baguette setting features two smaller diamonds channel set around the center stone. These two diamonds total 0.35 cttw which means how big of a diamond is selected for the center will make the side stones feel larger or smaller. A half carat diamond will give the appearance of three smaller, fiery stones. Half carat diamonds range in price from about $1,000 to as much as $3,000. The most common size of an engagement ring diamond is in the one to two carat range. When side stones are considered, the total carat weight of most diamond engagement rings is approximately two carats. When all of these factors are considered, the most common engagement rings average around $5,000 to $15,000. However, two carat diamonds are considerably more expensive than one carat diamonds, so deciding how big of a diamond to use as a center stone matters. Larger, high quality stones can cost as much as $25,000 on their own. Finally, the most luxurious engagement rings are those which contain center diamonds larger than two carats. For the average American, these rings are out of budget. However, rings of this size are extremely common amongst celebrities and those with high end tastes. Diamonds larger than 2 carats typically start near $12,000 for just moderate quality. The most expensive diamonds that can be used for most engagement ring settings top out in the 5 carat range. These diamonds, with the highest quality in cut, color, and clarity cost nearly $150,000. This puts large diamond engagement rings for many, yet they are still desired by most.